MA4 is statically displayed as the 'gatekeeper' at the Don River Railway, as seen in this photo on 8 May 2003. This locomotive was built by Robert Stephenson & Hawthorns Ltd in 1951 as their builder's number 7422 and originally numbered M2 of the Tasmanian Government Railways' M-class 4-6-2 locomotives. These locomotives were built to the proven design of Indian Railways metre-gauge YB class pacifics. In 1957 the Tasmanian Government Railways began a program to modify a number of the M-class to make them better suited to freight work. The modified engines were known as the MA-class and were modified by fitting smaller diameter ex-Australian Standard Garratt (ASG) driving wheels and ex-B & C-class pony wheels. The weight distribution was also altered to place more weight on the driving wheels. New sandboxes for forward running were added on the footplate beside the smokebox, while the original sandbox in the dome was retained for reverse running. Locomotive MA1 was the trial conversion in 1957, while MA4 was the final conversion and completed in 1958. 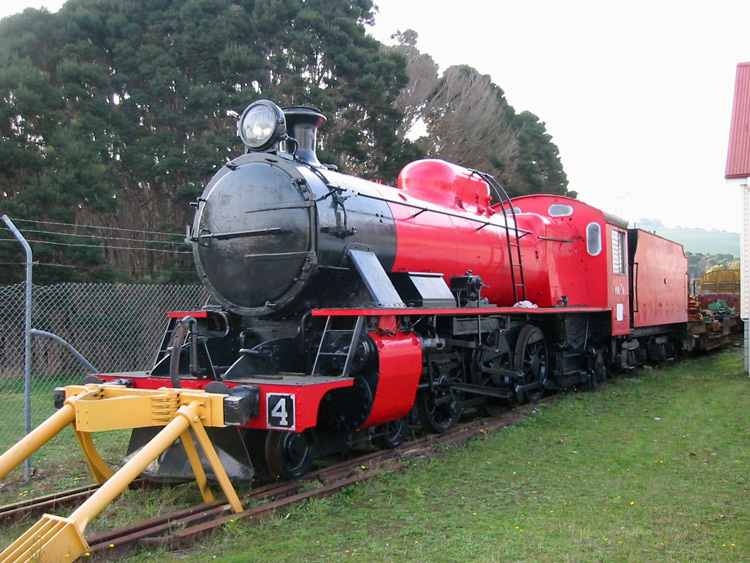 MA4 is now statically displayed as the gatekeeper at the entrance to the Don River Railway's heritage railway precinct and workshops at Don in Tasmania's north.